James Mitchell Ashley was born on November 14, 1824 in Allegheny County, Pennsylvania, near Pittsburgh. He was the son of Reverend John Clinton Ashley and Mary Ann (Kirkpatrick) Ashley. When Ashley was two years old, his family moved to Portsmouth, Ohio, where his father operated a small bookbinding business and a soap and candle-making establishment, in addition to serving as an ordained minister. A strict and devoutly religious man, the elder Ashley pressured his son to enter the ministry. Chaffed by his father’s domineering nature, the younger Ashley left home as a teenager to work as a riverboat cabin boy. Following a few years on the Ohio River, Ashley returned to Portsmouth to learn the printing trade. In 1848, he founded the Portsmouth Democrat, but the publication quickly failed. While pursuing his newspaper interests, Ashley began studying law. In 1849, he was admitted to the Ohio bar, but he rarely, if ever, practiced law. During his years on the river and in Portsmouth, Ashley was exposed to the evils of slavery, spurring him to become a lifelong abolitionist. In 1851, Ashley married Emma J. Smith of Kentucky and moved to Toledo, Ohio, where he opened a drug store. His move may have been prompted by concerns for his safety due to his deep involvement in the Underground Railroad. While living in Toledo, Ashley became active in politics. In 1856, he was selected as a delegate to the national convention of the newly emerging Republican Party. In 1858 and 1860, voters of Ohio’s Fifth Congressional District elected Ashley to represent them in Congress. After Ohio’s congressional districts were redrawn, Tenth District voters elected Ashley in 1862, 1864, and 1866. In total, Ashley represented Ohio in the Thirty-sixth through Fortieth Congresses from 1859 through 1869. Ashley’s tenure in Congress spanned the entire Civil War and part of the Reconstruction Era. During that time, he aligned himself politically with the radical element of the Republican Party, especially on the issue of abolition. He was a strong supporter of the Confiscation Act of 1861 and the Confiscation Act of 1862. In 1863, Ashley introduced the first proposal during the Civil War for a constitutional amendment to abolish slavery in the United States. Modeled after the wording of the Northwest Ordinance of 1787, Ashley’s motion was the foundation for what would become the Thirteenth Amendment, which was passed by Congress on January 31, 1865 and ratified by the required number of states on December 6, 1865. During the Reconstruction Era, Ashley was a vocal critic of President Andrew Johnson. Although he never produced any concrete evidence, Ashley went so far as to suggest that Johnson was a conspirator in President Abraham Lincoln’s assassination. In January 1867, Ashley introduced a motion in the House of Representatives to impeach the president. After near a year of consideration, the House Judiciary Committee endorsed Ashley’s proposal on November 21, but the full House rejected the committee’s report. Three months later, on February 24, 1868, Ashley voted with the House majority in favor of a new set of charges against Johnson that led to the president’s impeachment trial and subsequent acquittal by the United States Senate. Ashley’s vendetta against the president, coupled with his extreme views regarding Reconstruction, may have struck discordant notes with his constituency back in Ohio. In the November 1868 midterm elections, Tenth District voters elected Democrat Truman H. Hoag to replace Ashley in Congress. Ashley was not out of work for long. At the conclusion of his congressional term in 1869, President Ulysses S. Grant appointed Ashley as Governor of the Montana Territory. Ashley assumed his new office on April 9, 1869. His Radical Republican views were not well received by Montana residents, most of whom were Democrats. After only a few months in office, Ashley found himself at loggerheads with the territorial legislature. In addition to his troubles in the West, Ashley earned the enmity of moderate Republicans in the East by describing the party as being “dumb in the presence of a dummy.” With his performance being assailed by both major political parties, President Grant summarily sacked Ashley without comment in December 1869. Following his brief tenure as governor, Ashley returned to Toledo to practice law. Perhaps because of his dismissal by the president, Ashley joined the Liberal Republican Party, which aimed to oust Grant and his radical allies from power. In 1872, Ashley served as a delegate to the party’s national convention in Cincinnati. When the Liberal Republicans dissolved after Grant’s reelection, Ashley switched his political allegiance to the Democratic Party. In 1875, Ashley moved to Ann Arbor, Michigan and immersed himself in the railroad business. Ashley purchased the Toledo and Ann Arbor Railroad in 1877 and then invested several years extending the existing line across Michigan’s Lower Peninsula to Lake Michigan. Ashley served as president of the reconfigured Toledo, Ann Arbor and Northern Michigan Railroad until the company went into receivership during the Panic of 1893. 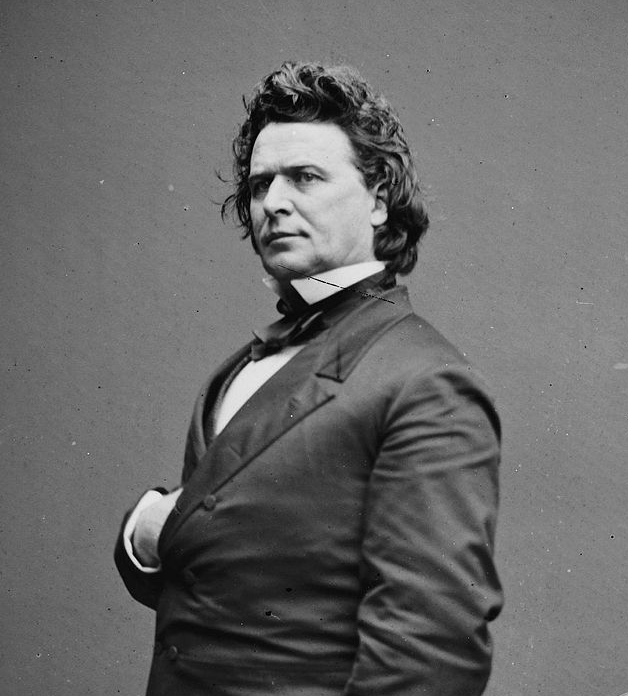 During his tenure with the railroad, Ashley also rejoined the Republican Party and made two unsuccessful attempts to return to Congress. In 1890, incumbent Democrat William E. Haynes held off Ashley’s attempt to unseat him from Ohio’s Seventh Congressional District seat. In 1892, Democrat Byron F. Ritchie defeated Ashley in an extremely close contest to represent Ohio’s newly created Ninth Congressional District (50.02% to 49.98%). Following the failure of the railroad and his two unsuccessful attempts to return to public office, Ashley retired in declining health. A victim of acute diabetes, Ashley suffered a fatal heart attack on September 16, 1896, in Alma, Michigan. His body was returned to Ohio and buried at Woodlawn Cemetery in Toledo.